When Kim Jong Un ascended to the leadership of North Korea in 2011 after the death of his father, he was the world's youngest head of state, the object of condescension and even ridicule. He had a negligible resume and a goofy haircut. Nobody thought he would last more than a few years, and if he did, it would be only as a figurehead. He also has proved himself far more ruthless. While Kim Jong Il usually exiled rivals to the countryside or assigned them obscure diplomatic posts abroad, his son hasn't hesitated to kill, disposing of his uncle and regent Jang Song Taek in 2013 with a firing squad, and ordering last year's deadly nerve agent attack on half-brother Kim Jong Nam in the Kuala Lumpur airport. Trump's surprising acceptance of Kim's invitation to meet has elevated Kim on the world stage to the point where he is being courted by everyone from Chinese leader Xi Jinping (they've met twice since March) to Russia's Vladimir Putin, who this week invited him to Moscow. "Trump should not underestimate Kim Jong Un. 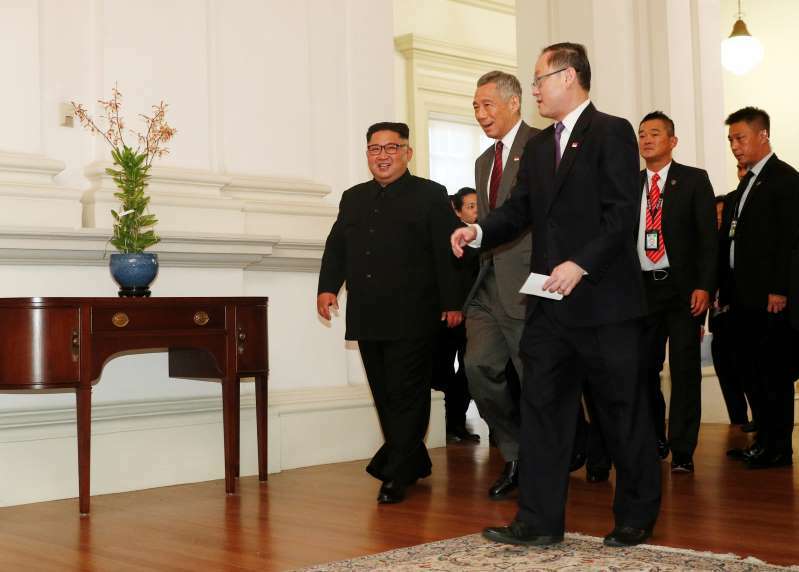 He shouldn't be going into this summit thinking, 'Kim is some young boy,' " said Gi-Wook Shin, director of the Walter H. Shorenstein Asia-Pacific Research Center at Stanford University. "He is the perfect dictator. Smart, pragmatic, highly realistic and brutal," said Andrei Lankov, a Seoul-based scholar who has lived and worked inside North Korea. Among outsiders, there is a tendency to view North Korea's leaders as reincarnations of each other - all named Kim, short and pudgy ("Fatty #3" is the unflattering nickname on Chinese social media). But this Kim, now about 34 (exact ages are a state secret in North Korea), has quickly distinguished himself from the pack. As for what he wants, one need look no further than his own words. In his first major policy directive in 2013, he told the Central Committee of the ruling Workers' Party that he would adopt a strategy known as byungjin, after the Korean word for parallel: simultaneously developing nuclear weapons and building the economy. Four out of North Korea's six nuclear tests took place under Kim Jong Un. The most recent, in September, was up to 10 times more powerful than the U.S. bomb that destroyed Hiroshima in 1945. The intercontinental ballistic missile that North Korea launched in November was deemed capable of reaching New York or Washington, D.C.
South Korea's national bank estimated that North Korea's economy in 2016 grew 3.9%. That's the fastest pace since 1999 and a growth rate that exceeds that of the infinitely more developed South. "Kim Jong Il saw markets as the enemy of the socialist system. Kim Jong Un has realized that they can't live without market," said Benjamin Katzeff Silberstein, a scholar and co-editor of the North Korean Economy Watch. Market growth has taken some of the edge off the chronic hunger that plagues North Korea's population. It also has kept the economy humming along despite the "maximum pressure" sanctions imposed by the Trump administration. "It boggles the mind that they have been able to keep prices for rice and exchange rates stable throughout," Katzeff Silberstein said. Katharina Zellweger, a Swiss aid official who has worked in North Korea for more than two decades, noted several new developments on her most recent trip - more greenhouses to provide fresh produce during the long winters, more North Korean-made products like potato chips and candies and playgrounds in provincial capitals with trampolines for children. "You do see that life has improved a little," Zellweger said. "I get the sense people generally are satisfied with the steps Kim Jong Un has taken." "He is generally, remarkably more popular than his father and probably than his grandfather," Lankov said. "Why? The economy. ... And on top of that, people like nuclear weapons. They are proud." North Korea's state television broadcasts constant footage of Kim surrounded like a rock star by adoring crowds of young fans. "At least you get the impression from television that he's wildly popular, with people mobbing around him," said an expatriate who lives in Pyongyang and asked not to be quoted by name. Nevertheless, economic reforms have not been accompanied by political liberalization. Kim hasn't budged on human rights. Authorities have tightened control over the 800-mile border with China and stepped up prosecution of people caught with South Korean music, movies and TV shows. North Korea remains one of the world's poorest countries. Its per capita income is less than 5% of South Korea's. According to the U.N. Office for the Coordination of Humanitarian Affairs, 41% of the population is malnourished. "A hundred people fight over a single bowl of rice," said a middle-aged defector from the northeastern city Chongjin, who asked not to be identified. The economic sanctions have sliced out an estimated $1 billion of North Korea's exports, estimated in 2016 at $2.9 billion. At least initially, ordinary North Koreans didn't feel the bite. Because China no longer was buying coal or seafood, there was more available on the domestic market. And China has kept exporting food and basic consumer goods to North Korea. "It hasn't been sustainable. Economic reforms have had a positive effect on the North Korean economy, but they can't continue down that path forever. They need sanctions relief," said Stephan Haggard, a political scientist at UC San Diego who specializes in the North Korean economy. Kim - and a team of advisors who have followed U.S. politics for decades - have been studying Trump since before the 2016 presidential election, hanging on to statements he made as a candidate, such as his now-famous offer at a rally in Atlanta in 2016 to sit down with Kim over a hamburger. "Maybe nobody else was paying attention, but the North Koreans listened to every word," said Leon V. Sigal, director of the Northeast Asia Cooperative Security Project at the Social Science Research Council. Since then, each move has been carefully coordinated, from including his attractive kid sister (North Korea's "Ivanka," the media has called her) in the delegation sent to the Winter Olympics in South Korea, to the enormous white envelope that North Korean envoy Kim Yong Chol handed Trump at a White House meeting on June 1. "Trump's psychology is pretty obvious to just about every leader in the world. He doesn't like to be criticized. He loves to be stroked. He's interested in the bold stroke, especially if he's at the center of it," Sigal said. "And that gave the North Koreans the sense that this was somebody they could work with."